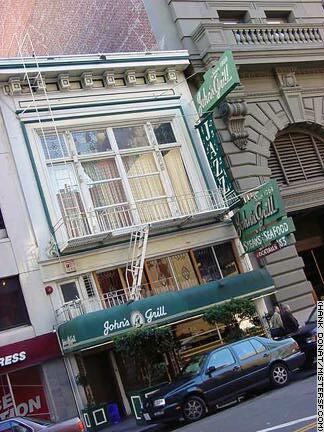 Though John's Grill, 63 Ellis Street, does not appear in the 1941 film version of The Maltese Falcon, Dashiell Hammett wrote in the 1930 novel, "[Sam Spade] went to John's Grill, asked the waiter to hurry his order of chops, baked potato, and sliced tomatoes, ate hurriedly, and was smoking a cigarette with his coffee when a thick-set youngish man with a plaid cap set aside above pale eyes and a tough cheery face came into the Grill and to his table." The 1908 restaurant in the Tenderloin was a favorite of Hammett, who lived and worked in the neighborhood and filled his work with Tenderloin locations. John's continues the Hammett tradition on every level, by maintaining its appearance pretty close to the original, and with it's upstairs Maltese Falcon Room. This meat-and-potatoes (okay oysters, too) restaurant is also the venue for the annual 1906 Earthquake and Fire survivor's luncheon and is a revered spot for literary tourists, cops, politicians, and other longtime San Franciscans.